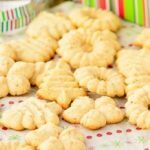 Norwegian Almond Cookies are lightly sweet, full of almond flavor and have an airy-like texture. Make them for special holiday treats and homemade gifts. Cream butter, confectioners sugar, and salt in a large bowl until light and fluffy. Add almonds and mix until well blended. Add egg and lemon juice and mix until combined. Press dough from a cookie press using desired disks at least 1 inch apart onto ungreased cookie sheets (do not use parchment or non-stick cooking mat). Bake for 7 minutes or until edges are lightly browned. Transfer cookies immediately to wire racks to cool. *Sift almonds through a coarse sieve or colander to make sure there are no larger bits that will not fit through the holes in the pattern of your cookie press disk.